A Friday evening in early June: the sky is clear, so astronomy enthusiasts take their high-powered telescopes into Lincoln Center and face them up. One dapper upper-west-sider has a large sleek Orion double refractor telescope that he’s allowing people to look into on their way out of the theater. Women in beautiful dresses hold the arm of a date. They step uncertainly with dainty shoes onto the stoop to peer through the viewfinder. One step off of the ground and one step towards the heavens. For us it’s my mother and I and we interrupt a conversation about the travails of work to inspect Jupiter. At first the image is a flashing mess of mirrors, and then, with the correct angle, the planet appears. It’s small, but shockingly distinct. The colors are practically nonexistent. The bands along the surface twirl like dancers. It appears to be spinning very fast. Everything surrounding is dark. I make out no moons or rings as I focus on the planet. It’s as if, in those several moments of seeing Jupiter, the planet eludes a secret in its quiet dance. The feeling is simultaneously empty and comforting. Jupiter is a gas planet and fifth planet from the sun. It is twice as large as all of the other planets combined, nearing the size of a sun itself: the dwarf twin to our star. In fact, if it were to amass more weight, it would ignite into a star itself. Besides Venus, it is almost always visible to the human eye. Even in the middle of the civilized world, in Lincoln Center. Each of the bands of color represents a slightly different chemical composition and temperature. The large red spot on the planet is a hurricane-like storm that has been perceived for hundreds of years. We have yet ventured past the primary clouds around the planet. The immense magnetism would prove fatal for a human voyager, and perhaps even a robot. So we’ll never see the scapes of Jupiter. But imagine a world that has no land but solidifies slowly to the core. 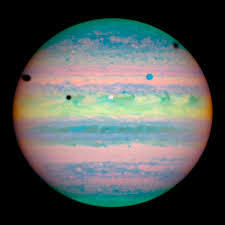 Jupiter is the Greek name for the Roman God, Zeus. Each of the approximately 60 moons surrounding the planet have been named after figures in his life, namely his lovers. Many are believed to hold water and could potentially hold life. In the beats of looking into the viewfinder, body curled up and eye in the sky it’s as if you’re transported there into space where all things are open and quiet. And how did Galileo feel when he looked upon the wandering star as a planet? After discovering the moons of Jupiter he was able to deduce that earth itself is moving. It's all moving in order - a dance. It is supposed to rain diamonds on Jupiter. The heat is so high that it melts the crystals in the atmosphere that rain down like water on the planet. This may be misinformation, but are those the famous drops of Jupiter? Sometimes magic comes out of thin air, and you realize that you're standing there looking at Jupiter, the real thing, not an image. There is really something other than our highest peaks. There is really a land that we cannot even imagine. It’s like looking into the eye of a great God, and its unfathomable meaning, places all the rest to a rhythmic dance, and is that not a comfort?